The new hero has arrived at Heroes of the Storm, Blizzard Entertainment MOBA game. Meet Mephisto, the Lord of Hatred, one of the Prime Evil brothers. Mefisto born in Diablo universe, one of most popular hack’n slash game. As one of the Prime Evil, he took part in conquering the Nephelem World, which was created by Angel and Demon. Mefisto joins the game as an assassin. He deal big damage but same lack resilience. His main role will be supporting team by stunning enemies and dealing splash damage to them. SKULL MISSILE – Conjure a skull that travels in the target direction after 0.75 seconds, dealing 127 damage to enemies hit and Slowing Heroes hit by 25% for 2 seconds. LIGHTNING NOVA – A ring of lightning appears around Mephisto for 2.5 seconds. Enemies within the ring take 48 damage every 0.25 seconds. Each time a cast of Lightning Nova hits a Hero, its damage is increased by 4%, up to 40%. 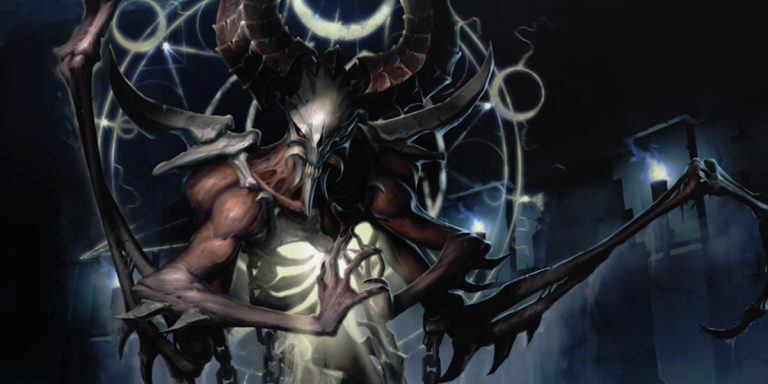 SHADE OF MEPHISTO – Teleport to a location, dealing 78 damage to nearby enemies and leaving behind a Shade of Mephisto at Mephisto’s original location. After 2.5 seconds, Mephisto is teleported back to the Shade’s location. CONSUME SOULS – Channel for 2.5 seconds, revealing all enemy Heroes. After the Channel completes, all enemy Heroes take 357 damage and are Slowed by 40% for 2.5 seconds. DURANCE OF HATE – After 1 second, unleash a wave of evil spirits that Root the first enemy Hero hit for 2 seconds and deal 160 damage to them over the same duration. Durance of Hate spreads outwards from its initial target, Rooting and damaging additional nearby enemy Heroes. Do you like the new hero in Heroes of the Storm?